These tubes are not for everyone however, they are for the adventurous and experienced tubers with thousands being sold annually. These tubes are for fun- not a life saving device! Perfect, for year round fun. 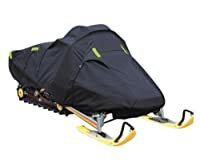 Winter: Snow tube in the mountains, off trail or at the local sled hill. These are durable and tough tubes that will last. Continual snow tube usage improves the ride. 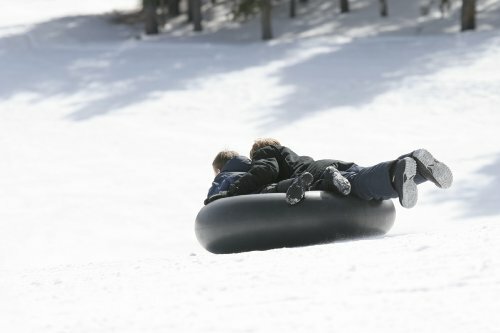 Snow Tubing Tips: • Do not be afraid to INFLATE tube to proper size, under-inflated tubes go slower on snow. Tube must be firm to the touch. p> Inflate\deflate tips: • Use Got Air (pump) as the tube fills use a start\stop method; add small bursts of air, stop air flow, add air, continue until full. • To deflate- use a standard valve tool (found at most auto stores) and remove the valve core. Re-insert valve core; seat it tightly to avoid slow leaks. Express Yourself: Personalize your tube by using plastic paint (won't transfer to clothing or skin) Go crazy...get creative...go extreme! 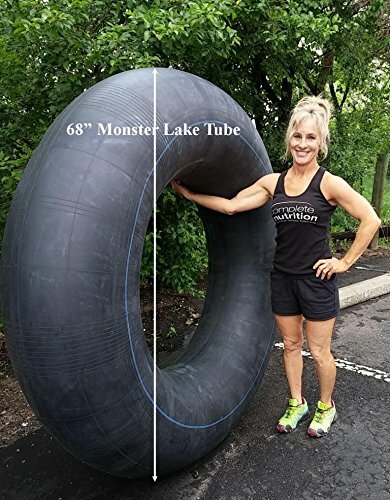 Tube Sizing: • Small tube inflates to 32" suitable for individuals 120 lbs or less. For very small kids, this tube works great in water, but the kiddo may be best to ride with an adult on snow. 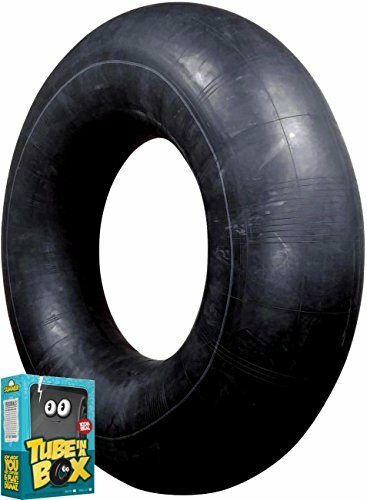 • Large tube inflates to 40" suitable for in between sizes of 120- 175 lbs. 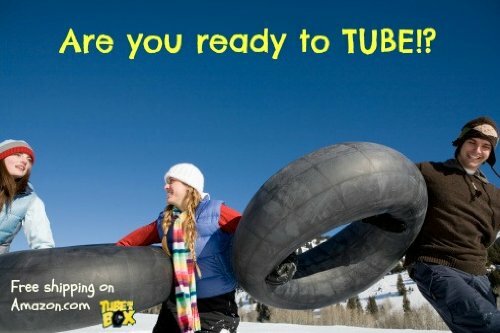 • XL tube WILL inflate to 45" and fits adults up to 280 lbs. Tube in a Box appreciates your feedback, if you have additional questions or comments contact us maybe we can help. 100% COMMERCIAL GRADE RUBBER: A combination snow & swim tube perfect for sledding, swimming & floating! These are real old school inner tubes like the ones that first invented all the fun. Durable and tough - ready for any season. SAFETY VALVE STEM: No more being poked with one of those long metal stems from the old days. Our unique rubber valve stem & cap is engineered for safety. It is less noticeable and shallow to the body of the tube. It protects you from scrapes & bruises. You're going to love it! UV PROTECTED / TEAR RESISTANT: These inner tubes are UV protected so the sun won't harm the tube and cause it to deflate prematurely. The tubes are durable and very tear resistant and will not pop like many vinyl tubes. PROPER INFLATION: Be sure to properly inflate your inner tube to the fullest size as specified: 36", 40", 45" or 68" outside diameter for best results. 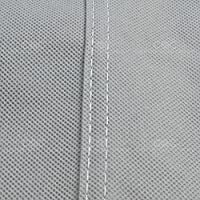 Use the stop and start air flow method to prevent bulging. See our video on you tube. Note: the inner diameter will decrease as you inflate your tube. 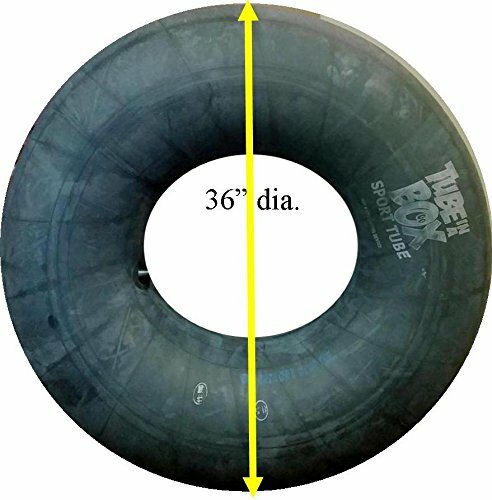 *INNER TUBE COVER*: We have heard you loud and clear and now have covers for the 36" inner tube. The inner tube's cover will secure the rider and allow the smaller children to have more fun. At times, smaller tubes with light weight children may not go as fast as the larger tubes with heaver riders. 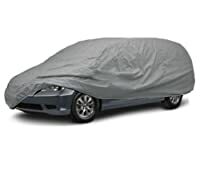 A cover may be just the way to help providing a smoother, faster ride as it glides down the hill. Get them while you can!